Stuck in a place you're not familiar with? Want to know the nearest pizza place? 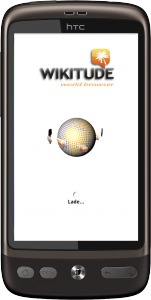 Download the Wikitude World Browser 5 and see the world around you in a different light. Wikitude is an augmented reality browser that scans your surroundings for geo-referenced content using the camera and the device's censors. The objects' information is displayed is the cam right where the real object is located. Providers (known as worlds) have created POIs in almost every corner of the globe, and you'll be able to look around using your smartphone and see what's around you. Jonesing for some good grub? The power location aware search engine scans all the local worlds for your search term and gives you the relevant matches in your immediate location. It's a great tool for exploring a new country, or even just looking at your old haunts in a new light.